Laura is a fine art photographer specializing in weddings & events across the world. Her at-ease approach with couples, paired with her ability to truly see and feel emotion throughout a wedding day, have been the fundamental elements in developing her distinctive style. 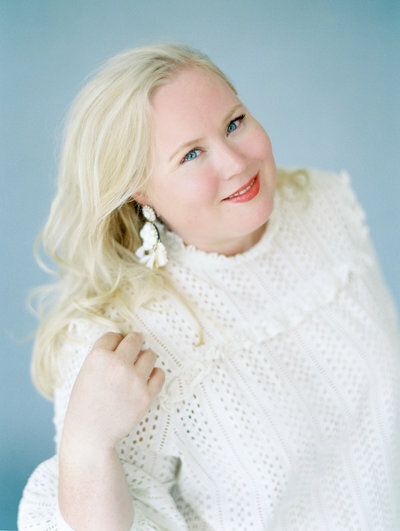 Her work has been featured on Martha Stewart Weddings, Elle Magazine, Southern Weddings Magazine, The Knot and more. In 2015 she was named the Film Photographer of the Year by Belle Lumiere Magazine. D'Arcy Benincosa is the ultimate Marketing Ninja, Brand Strategist, and Business Coach to creative entrepreneurs. After getting hired by Sports Illustrated magazine she quit her day job as a teacher and began her photography career in earnest. Based in NYC and Paris, D'Arcy's destination wedding photography is regularly featured on the top wedding publications including Bride's, Harper's Bazaar, Style Me Pretty, and Once Wed. Her weddings have graced the screen on The View, ABC, and NBC. Her love stories have also been featured on Upworthy, Huffington Post Weddings, and even tweeted about by Stephen Fry. They began as penpals, became best friends, and fell in love. Now, photographers Michael and Carina share a love of film and a deep awareness of history, beauty and emotion in their work. They photograph couples across the USA & Europe, and their images have been featured in Southern Weddings, Bride Magazine, The Knot, Style Me Pretty, Wedding Sparrow, Magnolia Rouge, Belle Lumiere, Elizabeth Anne Designs, Once Wed, Hochzeitswahn, and Hochzeitsguide, among others. In 2014 they were named Belle Lumiere Magazine’s Emerging Film Photographers of the Year, and in 2015 were named among the Best Photographers in the world by Mod Weddings. Michael & Carina's primary goal is to capture images in a way that authentically documents real couples while creating timeless, emotional heirlooms. Brooke is a wild-hearted family photographer based in Salt Lake City, Utah and can most often be found dancing on the street and helping other photographers make meaningful art + businesses that light a spark inside 'em. She'll never be able to go a day without hugging someone and singing. Yeah, her work's been featured in Vogue and Martha Stewart Weddings and blah, blah, but what Brooke really cares about is what she's accomplishing in the name of love. In the hard, hard work of not only feeling love--anyone can do that--but choosing love, within the four walls of her family every day, silently, with no one else there to witness. Because those battles and wins--those are her reasons for creating, and the most excruciating and gloriously joyful experiences on this planet. Eric was named one of the Best Photographers in the country by Harper's Bazaar, Brides & Martha Stewart Weddings. He travels internationally for some of the most stunning and beautiful weddings and events. He is known for his authentic and delightful imagery, as well as his affable personality that lends itself to the most incredible couples and clients. His work can be seen in publications all over the world. Pim was born and raised in Thailand but is currently based in Hong Kong. She is the epitome of a modern renaissance woman; her passion for life and art are captured by her proficiency in both analog and digital mediums. Pim’s photography journey has taken her from family breakfast photos to top Michelin Star dishes in Hong Kong in less than five years. She is the preferred photographer for some of the best hotels in Hong Kong. They love her for creating soulful portraits of top chefs and a unique style of food photography that showcases their signature dishes. Perry Vaile is a wedding photographer who credits her success to good humor, the magic of persuasion, and an unmitigated obsessive personality. She happily supports a stay at home husband and their two daughters, while traveling frequently for work and life. Her work has been in international Vogue, Brides Magazine, Martha Stewart, Huffington Post, Cosmopolitan and on her mother’s fridge. As a former professional historian, she believes in the timelessness and singular beauty of film, and believes her background has shaped her approach at capturing wedding days, as pieces of history.